Maple/Bacon beers are weird for me as they're hard to brew. With maple, I've found that either you end up brewing a beer that's way too sweet and over-the-top in maple or else the maple is too subtle where it could be just about any other "sweet" flavour - like caramel rather than actual maple syrup or smoked maple. Then there's bacon: most bacon beers don't have any notes that are in any way reminiscent to bacon. The closest thing to bacon I usually find in bacon beers is smokiness. With bacon flavoured beers - you don't want to piss off the vegetarians/vegans, because they will be very vocal about it not being a vegan friendly beer. The only maple beer I truly loved so far was Cannery Brewing's Maple Stout, which was an incredibly sweet and over-the-top stout, but it was amazing for dessert.. or breakfast. Now: Central City's Red Racer Maple Bacon Ale has been in Manitoba for a while now, I haven't had the chance to try it out yet because I've been busy for the past few weeks and frankly.. it sold out within a few days at my local LCs. Central City is one of the most solid breweries in BC, so I know I'm drinking a quality beverage... but maple and bacon is still a bit weird for me for beers. Appearance: The maple bacon ale pours a copper-caramel ale, clear, moderate amount of carbonation and a thin amount of beige head. Aroma: Light smokiness, sweet caramel maltiness, moderate bready aromas and table pancake syrup. Only trace amounts of maple make its way in the beer, but it reminds me more of table syrup (non maple syrup) rather than maple.. so that's never a good thing for me. However, it's alright.. a bit reminiscent of a sweet amber ale. Taste: The first thing I taste here is Hawkin's Cheezies.. minus the cheese powder. The flavour profiles are all over the place. There's a sweetness that's a combination of table pancake syrup and a hint of maple, a hint of smoky faux bacon taste that you would see in potato chips. Light nuttiness, slight saltiness. As it warms up, I'm noticing a light amount of spice warming up my tongue.. perhaps a bit of chipotle? The spiciness is intertwined with the smokiness. The maple is there, but it just tastes a bit off. Overall Thoughts: Not one of Central City's better beers. 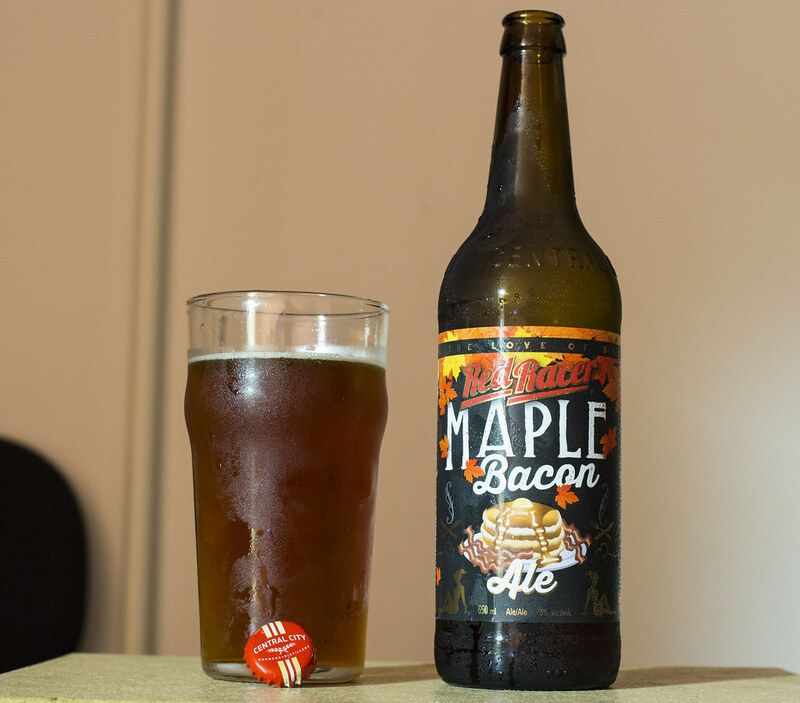 If they advertised this as a Smoky Amber Ale rather than a Maple Bacon Ale, I'd believe it more. The maple is more reminiscent of table syrup than maple syrup, which is disappointing. Most of the maple I do notice comes later on in the aftertaste.. I just wish it was more prominent in the flavour itself. I do like the light smokiness as I love smoked beers. I'll pass on this the next time I see it in store.